This issue starts the Kingdom Come arc in the JSA. 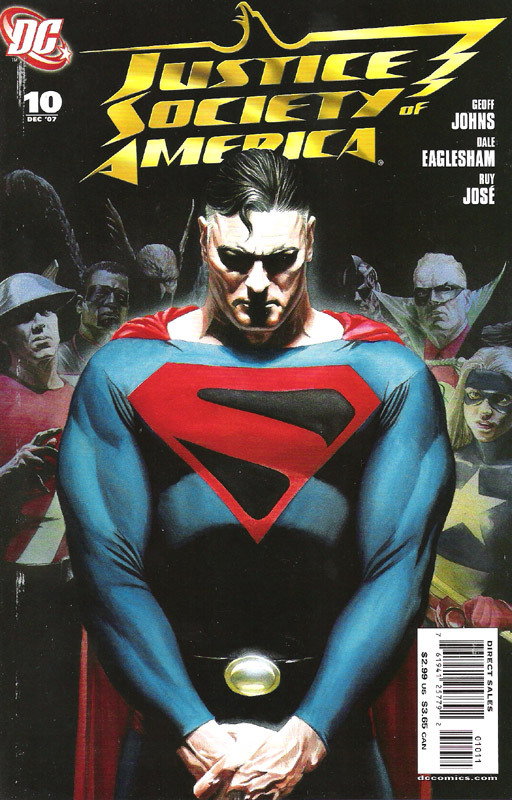 The Kingdom Come (aka Earth 22)’s Superman is questioned and detained by the JSA as they try to figure out just what is going on. During all this Superman is content to answer their questions as he voices his own. As he tells part of his story, we see snippets of pages from the Kingdom Come series created by Alex Ross and Mark Waid. As the JSA try to figure out what to do with him, they lock him in their conference room. As they continue to debate, Superman listens in until he hears the sound of a girl about to jump off a building. Of course he busts out and saves the day. Power Girl is having a hard time with his appearance – he reminds her of her cousin Kal-L’s death at the hands of Superboy-Prime. 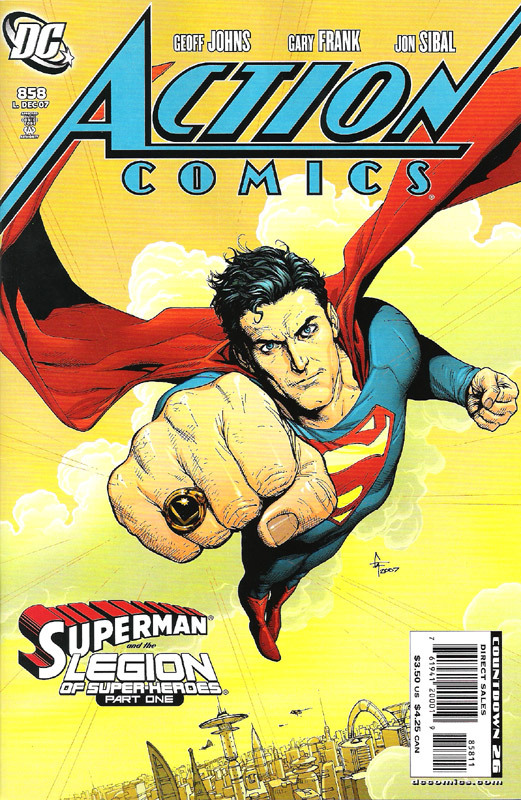 This is another great issue by Geoff Johns. All of the characterizations are spot on. Just like every issue to date. This title is a fun superhero romp. The basic premise is that Captain Dynamo, the world’s best hero, was not exactly faithful to his wife. Ok, he is a hound dog. In the wake of his death … in another woman’s bed, the city begins to fall apart as his rogue’s gallery begins wrecks havok. Maddie, his widow, theorizes that with sheer number of women in his little black book (filled with names, numbers, and dates), odds are that he fathered some children. She tracks down 5 young adults and brings them together as a team. Each has one of Captain Dynamo’s powers: flight, super strength, shape-shifting, telepathy and eye beams. The first trade contains the first 7 issues and is dirt cheap. This issue is a great jumping on point. It introduces a new villain and starts the threads for the next arc. Someone is killing people by freezing them solid a la Mr. Freeze-style. The character is Bonechill – an escaped convist exacting revenge on his former crew who turned him in. Visionary is grounded after being out for a couple of days and Scatterbrain is in a coma due to events in the trade (get it – you know you want to). Myriad is sent to cover for Scatterbrain’s absence from his home. This leaves only Scrap and Slingshot to take on Bonechill. As they fight him, Maddie calls in back-up, the Firebirds – a mother/daughter team of fire blasters. We leave off with a group of men looking photos of Slingshot in her civilian life. 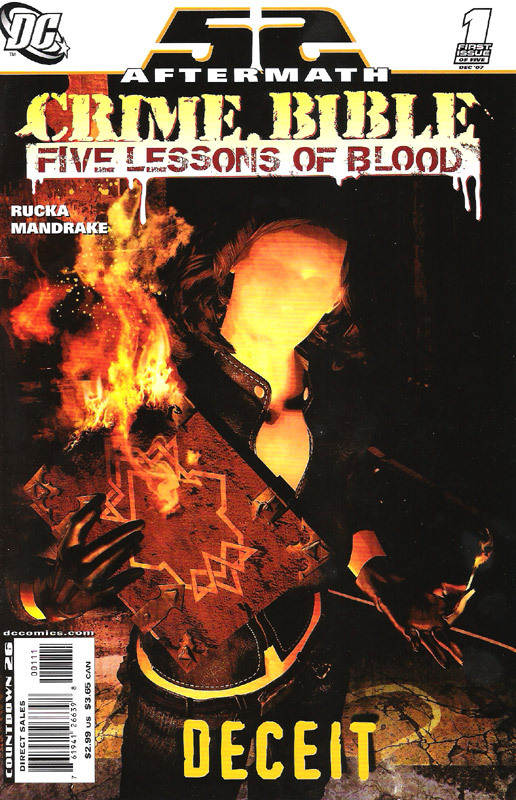 Greg Rucka continues the story of Renee Montoya as the new Question and the Crime Bible from 52. Rucka was meant to write this character. It has the flavor of Gotham Central and the characterization of the Question from the JLU cartoon. This issue begins with acolytes of the crime bible practicing on punching bags … punching bags filled with people. Turns out the crime bible is broken down into 5 crimes with murder as the most revered. A professor has written a book debunking the crime bible and those of its faith. Renee questions him on his source and follows him home. Turns out the professor was a true believer and is going to kill his wife and son to bring controversy and up book sales – getting info on the crime bible into the public’s hands. Renee busts in and stops him, but the head murder acolyte busts in and confronts her. As this is going on, the professor’s wife picks up a pair of large scissors and kills him. She is a true believer as well. She rushes up the stairs to kill her son, but is stopped by Renee as the acolyte makes his escape. Another Geoff Johns book. We get a look at young Clark’s initial meeting with the Legion of Superheroes – now in continuity again. A giant Braniac robot begins tearing into Metropolis. As Superman goes to take it down, a monitor lights up with the image of Braniac 5. He tells Clark that he is needed in the future. Clark being Clark, enters the time sphere hidden in the robot without hesitation. He emerges into a future in disarray. Soldiers are out in force attacking any superheroes they find. Superman tries to explain the situation, but they are not listening. The Legion shows up to save the day. Superman steps up to block a blaster shot with his hand – only to have a tiny hole burned through his hand. In the Legion’s time, the sun is red not yellow. I have been waiting for this storyarc since the Lightning Saga that played out in Justice Society of America and Justice League of America. We get an intro to the Return of Rhas Al Ghul. We learn that Damion is a testtube baby whose sole purpose is to be a vessel for the return of the Demon. 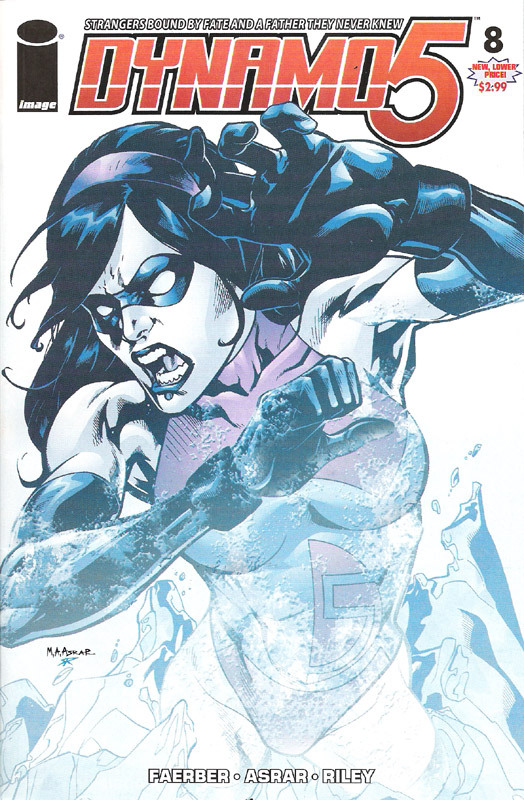 Rhas confronts Talia about Damion – who is wearing a Robin outfit. Damion is wanting to get Bruce Wayne’s approval – not Rhas. 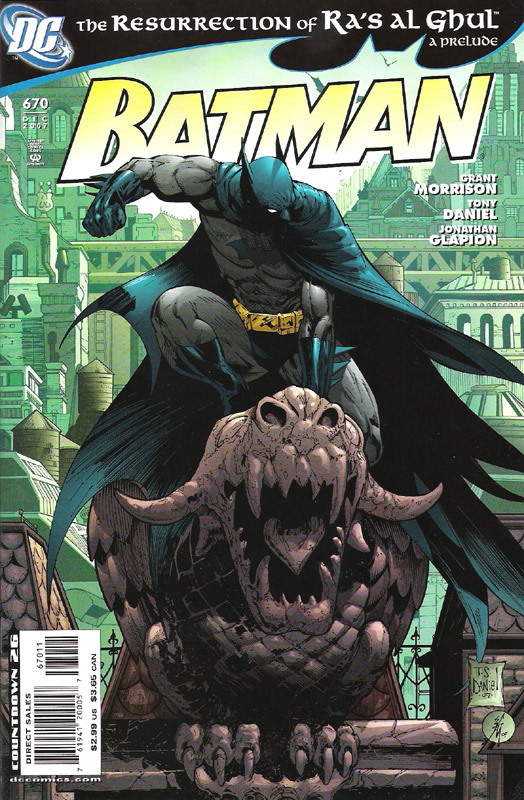 I really have not been happy with Morrison’s run on Batman. I am hoping this and the next arc will change my mind.